5 Acres & A Dream: July Means Blueberries! When we moved to our property last year we were delighted to find out that we have a large rabbiteye blueberry bush on the property. 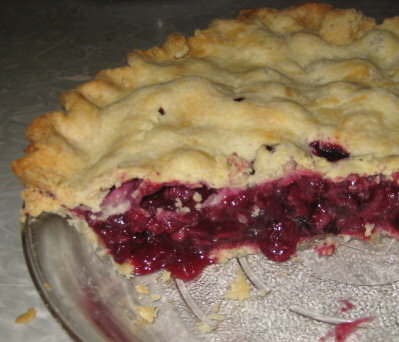 Blueberry pie is Dan's favorite, and those blueberries made a mouthwatering one. We also ate blueberry pancakes and muffins, and I was able to put 2 and a half quart jars full of dehydrated ones into food storage. As happy as we were to have them, I have to admit that they were a little disappointing; small, not very juicy, and not especially good for eating fresh. I figured this was becuase they were rabbiteyes, and so bought two new bushes to plant in the spring. Even so, I wanted to take care of the bush we had. It was badly overgrown so I cleared out all around it. In the fall I pruned it and mulched it with pine needles. In April it was loaded with pale pink blossoms and I looked forward to a bountiful harvest. Toward the end of June, Dan and I were walking the property and stopped by to check on the bush. It was loaded with berries and they were beginning to ripen! The next day I thought I might get enough for breakfast, and was able to pick five cups. And look at them! Big, plump, juicy, and sweet! Some of them are the size of a dime. What a difference from last year. First order of business? Blueberry pie! I think I'm going to love this as a tradition. My recipe? Click here. I'd like to think that caring for the bush helped, but also last year we were in the tail end of a drought. Water makes a big difference for the fruit. This winter and spring we got plenty of rain. 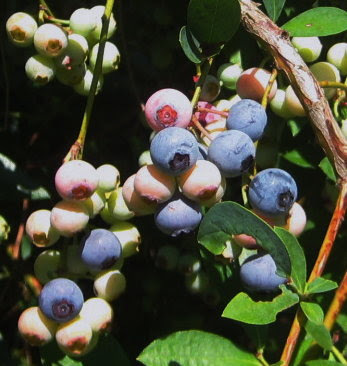 Between that and caring for the bush, we have beautiful, mouthwatering blueberries. Last year I dehydrated them. This year, I decided to try freezing the fresh berries. It's super easy because they don't require blanching. Just wash, dry, and spread out on cookie sheets to place in the freezer. After they're frozen, they can be put in containers and popped back into the freezer. For step by step details, click here. So far I've frozen 10 quarts, and the bush is still producing abundantly. The two little bushes I planted and later had to replace are struggling because of our long dry spell. I have watered them, but shamefully haven't made them my watering priority. Hopefully their pine needle mulch is helping them on that score. We're eating blueberries daily for breakfast, and putting them in pancakes and muffins, but maybe it's time to expand my blueberry repertoire. Blueberry pie is my hubby's favorite, too. That's his birthday "cake" of choice each year in August. I freeze mine as you do. I've only tried dehydrating them once and obviously I must have over-dried them as they were hard as marbles and we weren't able to use them as snacks the way we intended. But frozen, they are lovely! Oh, i love blueberries. I plunk a few of them into plain yogurt (with some splenda or other artificial sweetener) in it. I just planted 4 little bushes this year, hopefully i will have enough berries for pies in the future. I have wondered about the right way to dry berries like this. I have heard many people say they end up like small rocks, not the chewy little morsels they expected. I borrowed a book on drying foods from my local library, but i don't remember the exact instructions for berries past blanching them to break the skins. I'm sure it gave a hint on drying time so the berries don't overdry. I'll have to borrow it again and take notes. What a wonderful bounty! My favourite ways to eat blueberries are plain, with a bit of yogourt, on cereal. In pies and crisp, I like to mix blueberries and peaches. We won't have blueberries for another year or two at least and the raspberries aren't doing much at all this year. I'd had high hopes, but so far I've gotten 1/2 cup of teeny, tiny seedy berries. The bushes are old and look almost like they were wild ones dug up and replanted. This year I started replacing some of them with better producing varieties but it will take a while to get them established. Oh, how fortunate! I like blueberry buckle with hard sauce (once in a while, its a little decadent- though simple)- and The Girl likes blueberry jam. In pancakes, in muffins, but especially in smoothies!! I love it with just a banana as the other fruit or, better yet, with frozen cherries! YUM!!! Blueberries and wild huckleberries are my favourite berries for the freezer - I like adding them to smoothies fresh or frozen. So nice that the old shrub made it back! Maybe some blueberry goat cheese will be in order for next crop! I hope you've been visiting Tina's blueberry blog, Leigh. 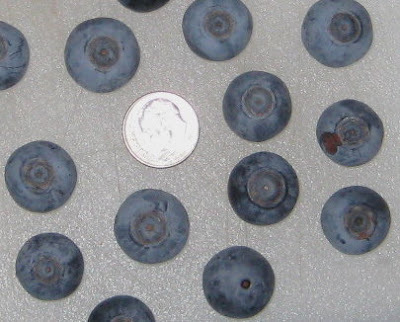 One of her sisters lives on a blueberry farm, so she's a great resource for all things blueberry! When my relatives were here from NZ, they ate blueberries every day. Ralph thought them crazy (he's not fond of them) but they explained that they don't get many blueberries in NZ and they are very expensive when they do see them. They loved them! Mama Pea, thanks for the feedback on the dried versus frozen. I didn't try to snack on our dried ones, just reconstituted them for pancakes and muffins. Of course, they were a little dry and seedy fresh that year, so I didn't expect a whole lot from the ones I did dehydrate. Sara, blueberry & peach? Sounds yummy! Icebear, with yogurt , oh yes. We usually eat our breakfast cereal with yogurt. The blueberries really make it yummy. I think with drying blueberries, there is an art to it that only comes from experience, kind of like learning to bake bread. There is a fine line between under and overdried. I've had things grow mold because I didn't dehydrate enough, but it's also possible to dry them too much. I suspect this to be true of most dried blueberries. I really should experiment with some of this year's crop. Nina, it seems to take awhile for the plants to get established. I suspect those dry summers when our blueberry bush was so neglected, it had to send those roots deep. It has certainly responded well to rain and TLC. I hope yours do the same. Bettina, blueberries are expensive to buy here too, so until we had our own, we never had any. Blueberry crumble sounds fantastic. Must try! Mmm, Maggie, that sounds like another must try. My grandmother used to make hard sauce. I probably have a recipe for it somewhere. Thanks for the idea! Mr. H, take heart. Last year's berries were small, so I was delighted to find out how well our rabbiteye could produce. My fingers are crossed for you for next year! Renee, sure, ya'll come on! Evelyn I found a huckleberry in a nursery catalog; I've got it somewhere. It said they can do well in the shade, so it's on my "must have" list. Glad to get your recommendation for that. Oh yummy Leigh. We like ours with some other fruits in a trifle or on a good quality vanilla ice cream. Glad your established bush came back so nicely! First off, that blueberry pie looks to die for! Seriously! Yummmmmm!!!! I am so jealous. I've always wanted blueberry bushes. Your's look wonderful!! I just love them all by them selves or in my moring ceral. Very nice! It's great to "inherit" something like that. Here the 20 gooseberries, elderberries and currants I planted in Spring aren't even growing, but we did eat 5 tiny white currants off one. 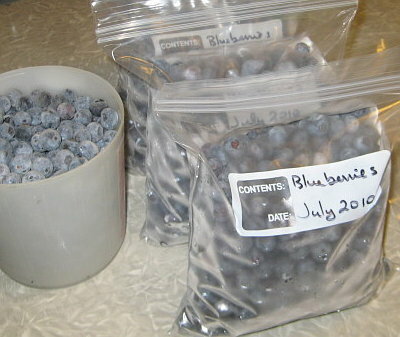 I'm keeping my fingers crossed and in the meantime I might revisit this entry and salivate over your blueberries a bit. Carrie, the level of moisture in dried foods is puzzling to me. Store bought raisins or prunes, for example, are moist and edible as is. So I'm always worrying that I'm over-drying things because the little rocks I end up with aren't what I want either. My dehydrator instruction manual gives a wide range of drying times for each item, so that doesn't help. Must experiment! Barb, you need to plant some! Katrien, my new fruit bushes are the same way, especially the blueberry bushes. The red raspberries have grown a little, but I know I've let them get too dry. I need a better watering routine.